President John Dramani Mahama has reiterated that the reason for re-structuring the Electricity Company of Ghana (ECG) under the Millennium Challenge Corporation (MCC) was because there was the need to improve revenue generation in the power sector. He said the introduction of Independent Power Producers (IPP) in the generation mix meant there was the need to improve efficiency at the downstream distribution level, where the ECG operates. 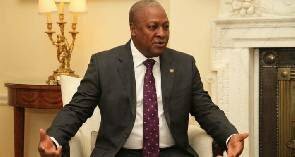 Addressing a press conference on Tuesday, President Mahama said the ECG had not been able to live up to that expectation of collecting revenue efficiently and expressed worry about the refusal of many Ghanaians to honour their utility bills on time, saying his own friends were culprits. “I have gone to many friends’ house and I sit and I see their electricity bill on the table and I take it, and he owes Gh¢1000, I say eii! you alone …somebody 800, somebody 500. I say ah! If you alone owe Gh¢1000 and you calculate the number of ECG subscribers like you, who are not paying on time, then what amount do we owe ECG, a lot of money. “And so we must improve collection, so that when people owe they pay promptly or they are disconnected, because when we don’t pay, then we make it more expensive for everybody else,” he said. The President said the worst crime carried out by those who steal power and that it was estimated that more than 25 percent of power is lost at the distribution level. He said the coming on board of Independent Power Producers (IPP) meant that enough money should be collected at the distribution level to be pay the producers. This is because, the IPPs are provided with Letters of Credit (LC) and when they are not paid, they draw down on the LC which means government has to top it up again. The President said when the Volta River Authority (VRA) was the only power producer and Ghana owed, “VRA would not cut our power but when an IPP sets up a plant and you don’t pay, he will take it from the LC and when that is done, we are committed to top up”. This, according to President Mahama, was the reason why efficiency ought to be improved at the downstream level, that is the ECG level. He said one of most recalcitrant culprits for non-payment was government institutions, because they hold the belief that they cannot be cut off. He said they don’t pay even though goods and services and budgets are approved for electricity and utility bills, yet once the money comes, paying those utilities is not the most attractive thing, rather the workshops at Dodowa where T&T will flow is what is of interest to them.